It's a dark night in a city that knows how to keep its secrets, but high above the mean streets, a light burns on the 12th floor of the Acme Building, where Guy Noir-hard boiled, world-weary, yet surprisingly articulate-is trying to find the answers to life's questions. In his big swivel chair under the bare bulb beside the beat-up gray file cabinet, he awaits the call of his clientele: the disappointed, the paranoid, the embittered, the rejected-and the hilarious. Garrison Keillor's private eye spoof has thrilled audiences every week for over twenty years on live public radio broadcasts of A Prairie Home Companion. 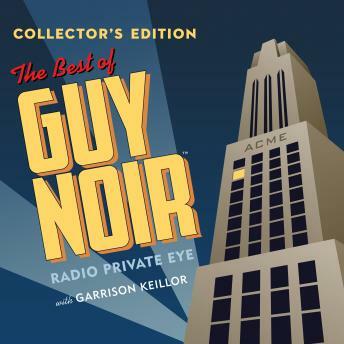 Now, for the very first time, thirty-six all-time favorite Guy Noir episodes are available in one collection. Follow the intrepid detective as he solves cases no other gumshoe would touch, and enjoy Keillor's intelligent-but always funny-spin on the classic detective genre. Featuring Garrison Keillor, Sue Scott, Tim Russell, Fred Newman, Tom Keith, Walter Bobbie and special guests, with music by Richard Dworsky.